QFD, FMEA and Pugh Templates for Excel (SnapSheets XL) allows the creation, analysis and modification of six sigma templates for houses of quality - quality function deployment (QFD), failure mode and effects analysis (FMEA), and Pugh matrices in Excel. The QFD, FMEA and Pugh Excel templates consist of Excel worksheets and charts and can be shared with anyone that has Excel. Pair-wise comparison matrix to rank order requirements. Generate House of Quality (HOQ) from previous house. Pareto Critical To Quality (CTQ). Optionally include different rooms in HOQ. Right click functionality to add and remove rows and columns or modify the matrix. Add or remove rows and columns without losing data. Grouping of failure modes for ease of use. Multiple causes per failure mode. FMEA severity, occurrence, and detection ratings for quick look up. Hide columns that are not needed for implementation. Quick Pareto generates graph based on RPN. Pareto by RPN, severity, occurrence, detection and more. Quickly add/remove groups, failure modes and causes. Create matrix with custom number of criteria and alternatives. Grouping of decision criteria for ease of use. Weighting columns to increase relative importance. Add/remove/insert groups, decision criteria or alternatives. Automatic calculation of the sum, number positive and negative. Pareto analysis of alternatives by Sum. Right click functionality to modify matrix. 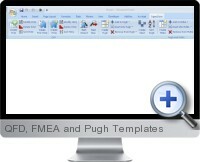 QFD, FMEA and Pugh Templates for Excel are compatible with Excel 2000 or higher.